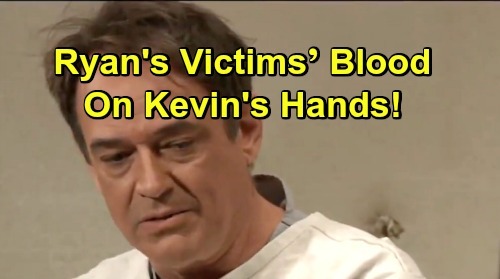 General Hospital Spoilers: Is Kevin to Blame for Ryan’s Deadly Destruction – Victims’ Blood on Dr. Collins’ Hands? General Hospital (GH) spoilers tease that Ryan’s (Jon Lindstrom) reign of terror will continue. GH fans know he’s caused plenty of drama already! Ryan killed Mary Pat (Patricia Bethune) when she threatened to get in his way. He also turned Ava’s (Maura West) life upside down by murdering Kiki (Hayley Erin). The charges against Griffin (Matt Cohen) won’t stick, but his life’s a mess right now, too. He’s mourning for Kiki and struggling with legal issues. Of course, Laura (Genie Francis) is living a nightmare as she watches “Kevin” push her away and fall hard for Ava. It’s clear that Ryan’s actions are having major consequences. Unfortunately, there’ll be even more consequences along the way. General Hospital spoilers hint that Kiki’s murder won’t be the last. Ryan may claim additional lives before his GH stint winds down, so the body count should climb. In light of all this deadly chaos, we have to wonder who’s truly responsible. Ryan is indeed behind the murders and other Port Charles mayhem, but we can’t forget who gave him the chance. Kevin thought he could get through to Ryan, but he clearly thought wrong. Now Kevin is being drugged out of his mind while his evil twin runs amok. It serves Kevin right for unleashing this madness! Kevin’s lengthy predicament may score him some sympathy when the truth comes out. However, he could still face some blame for letting Ryan gain the upper hand. If Kevin hadn’t brought Ryan to Ferncliff and tried to help, maybe Mary Pat and Kiki would still be alive. Perhaps Kevin would still be performing his usual therapist duties and Laura would have her caring husband by her side. Many General Hospital fans appreciate the excitement that Ryan’s delivering, but the affected GH characters won’t feel the same way. Ryan will certainly face hatred and quite possibly get killed by someone like Ava or Franco (Roger Howarth). Does Kevin deserve his fair share of blame, too? Laura might find it difficult to get past all this. Likewise, Ava could hate Kevin’s guts for setting this in motion. She’s sleeping with the man who killed her own daughter! That couldn’t have happened without Kevin’s stupidity, so maybe he shouldn’t get a pass here. He may be a victim, but he’s also partially at fault for the lethal weapon he’s let loose. Do you think Kevin deserves should be held responsible for his role in enabling Ryan? Will he face backlash from those who are grappling with losses? We’ll give you updates as other GH news comes in. Stay tuned to the ABC soap and don’t forget to check CDL often for the latest General Hospital spoilers, updates and news. General Hospital Spoilers: Should Liz Forgive Franco and Take Him Back?